Ballghazi FAQ: Patriots underinflation scandal explained. Where do football game balls come from in the first place? How did the Patriots come to be suspected of ball deflation most foul? Reportedly, a Colts player intercepted one of Tom Brady’s passes and gave the ball to an equipment manager who thought it felt light. The equipment manager told the head coach, who told the team’s general manager, who told the referees, who reportedly found at halftime that 11 of the 12 Patriots balls they tested were underinflated by 2 pounds per square inch of pressure. (The balls were then reportedly re-inflated for the second half.) As ESPN writes, “the balls are required to be inflated between 12.5 and 13.5 pounds per square inch and weigh between 14 and 15 ounces.” An official had reportedly inspected and approved the balls in question two hours before the game, but after that it’s possible that a Pats equipment manager (team employees are responsible for handing balls to the officials during play) could have taken them somewhere for shenanigans. Are people jumping to conclusions about this situation too quickly based on a vaguely described “NFL investigation” whose findings were leaked anonymously to a well-connected league reporter when literally during this same NFL football season information that was leaked anonymously to a well-connected reporter about the league’s Ray Rice investigation turned out to be completely, almost farcically, inaccurate in a way that reflected very poorly on the league’s honesty and basic competence? Why would you deflate a ball? A deflated ball is slightly lighter and has more give, and some players think that makes it easier to throw and catch. Others, like Packers quarterback Aaron Rodgers, disagree and prefer a heavier, harder ball. All these guys talking about how they like to grab their balls—LOL. Are the Patriots going to be disqualified from the Super Bowl for cheating? Why isn’t this a bigger deal? Because others have allegedly done it before, including Super Bowl XXXVII-winning quarterback Brad Johnson, who claimed to have “paid some guys off to get the ball right” in that title match. It’s also not a bigger deal because the Patriots won their way into the Super Bowl by beating the Colts 45-7 in a game that they dominated in all facets—running, blocking, and tackling, not just throwing. And they outscored the Colts 28-0 after halftime, when the balls were allegedly reinflated. So it doesn’t seem like ball deflation/cheating, even if it happened, deserves sole credit for their victory. 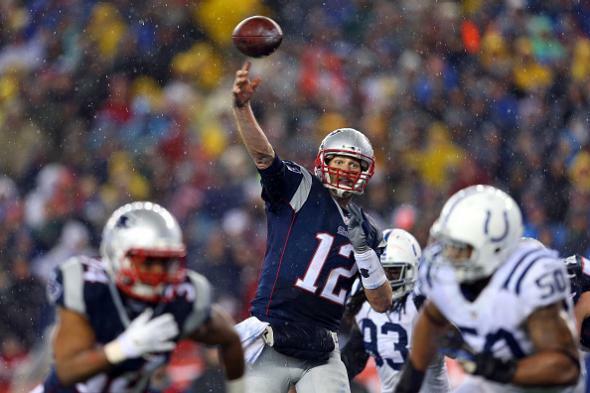 Even so, how big an advantage could New England have gotten from deflated balls? A Yahoo writer who went out and conducted a test of his own found that it was noticeably easier to throw and kick a slightly deflated ball. The Colts dropped a few catchable passes during the game with their presumably harder balls, but then again they dropped more passes than any other team during the regular season too. Could the balls have, conveniently, become deflated on their own? Air pressure drops when temperature drops, so it seems theoretically possible that New England could have cannily inflated its balls to the right pressure in a well-heated room, gotten them approved right away, and then let the 50-degree-ish weather in the stadium do its work. (In this scenario, Indianapolis perhaps inflated its own balls outdoors in the cold and thus didn’t see a pressure drop because there was no temperature change.) One seemingly well-informed contributor to this thread of nerdy Michigan football fans asserts that the observed loss in air pressure could have occurred if the Pats inflated their balls at 85 degrees. Do teams get to control their balls in other sports? In Major League Baseball the home team supplies balls, which the umpire checks before the game. Pitchers sometimes surreptitiously “scuff” balls to their advantage during play and are caught doing so with some frequency. The National Basketball Association rulebook calls for an “officially approved” ball inflated to between 7.5 and 8.5 pounds of pressure, but doesn’t specify any referee inspection techniques. What should I tell my kids about Ballghazi? If your kids weren’t already correlating barometric pressure and temperature factors against dropped-pass statistics in the prediction model your family maintains for gambling purposes, I don’t know what to tell you.